7. Air Jordan V "Toro Bravo - Red/Black"
Freshmen at 'Zona really are proper with their sneaker game before they even learn the offense. 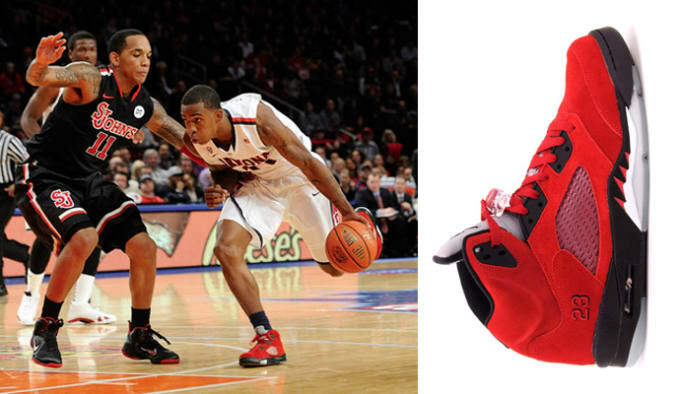 This year Turner brought out his personal red pair from the "Toro Bravo" V Pack and rocked them in front of 14,500 at the McKale Center. The blood suede upper and the reflective 3M tongue — you know these rank high with us.